Dimapur, Nov. 18 (EMN): The availability of quality higher education in the State is awfully inadequate. This is evident from the fact that every year thousands of Naga youth are going outside the State in pursuit of higher and technical education, while there is practically no reverse inflow of students to Nagaland from other states, stated the State chief minister TR Zeliang at the official inauguration of St. Joseph University on November 18 at Ikishe village in Dimapur district. This situation, Zeliang said, leads to many undesirable situations such as huge drain on the State’s economy, negative impact on the sense of national integration including some unfortunate ethnic and racial issues faced by the northeast region in some metro cities. “Such situation can be reversed when we have good institutions of learning in our own State, and students from mainland India can also come to the northeast for education and other educational and social events,” expressed the CM while conveying optimism that the University will make significant contribution towards bringing about that kind of change. Zeliang acknowledged that as the State chief minister, he tried to bring in two-three universities in the State which did not work out while admitting that initially there were hiccups with the name of the university which was earlier proposed as St. Joseph Catholic University. Founder of Daughters of Mary Immaculate (DMI) and Missionaries of Mary Immaculate (MMI) and Chancellor of the University, Rev. Fr. Dr. JE Arul Raj maintained that till date the University has drawn an amount of Rs 43 crore from the Union Bank of India and South Indian Bank for the University project. “The University has not paid any bribe to any individual for the project and we assure you that in five-ten years the University will be the finest in India and definitely in northeast region,” affirmed Rev. Fr. Raj. “We are well aware that the college education system in the northeast region and much of India in general suffers from a glaring defect since a very large proportion of college graduates in India are not employable because of the type of courses being offered in most colleges and universities,” pointed out Patton. Though the northeast region produces a large number of college graduates every year, the minister stated that only small portion of graduates were employable. As a result of this problem, he said a sizeable portion of educated unemployed youth of the region become vulnerable to various unwanted elements or organisations. Advisor of Higher Education, Deo Nukhu, suggested every private college in the State to be affiliated with St. Joseph University and asked the University to aim for NAAC accreditation. He expressed optimism that the University would overtake other Central universities. Bishop of Kohima and the Pro Chancellor of the University, Rev. Dr. James Thoppil, said that the University is the realisation of a dream of the Catholic Church to provide higher education to the State youngsters especially to those sections who cannot afford higher education. “The University I believe will provide the much long felt need not only in education but value based education even in the midst where this region is considered as the most corrupted by the other states”, conveyed the Bishop of Kohima. 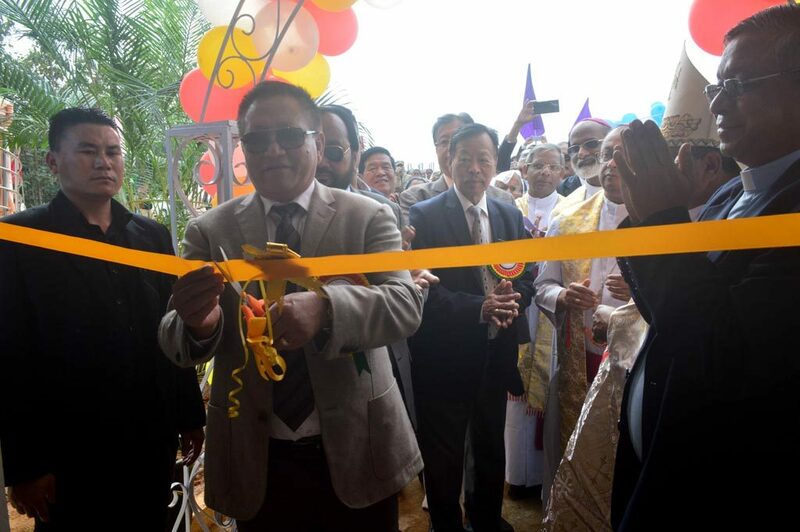 Parliamentary Secretary, C Apok Jamir, and the School Education Principal Secretary, Francis P Solo, also graced the inauguration of St. Joseph University. The University started with 43 students initially for both UG and PG section and till date it has enrolled 544 students out of the 1500 applicants received, it was maintained.